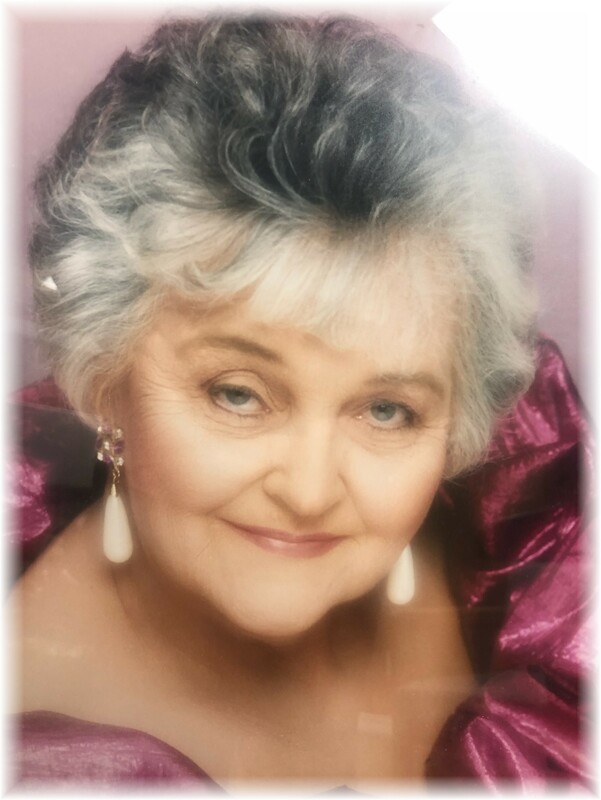 Lillian Marie Richardson, age 87, died December 3rd, 2018 peacefully in her home at Morning Star in Billings, MT. Lillian was born to Anna and Nicholas Dinius on March 12th, 1931. She spent her formative years in Richardton, N.D. After graduating from high school at St. Mary’s, she married David Saylor (1955) in Forsyth, MT. They had a family of three children. They divorced (1968) and Lillian married James Richardson (1970) in Miles City, MT. At that time their family grew to seven children. They were married for twenty-five years until Jim’s death in 1995. Throughout her life Lillian was known for her generous nature, love of her family and friends and her wonderful cooking and baking. She expressed her deep faith by selfless participation in church and community service. Lillian taught ceramics and had her own business for over 30 years. She was a talented artist who also was an established seamstress and enjoyed knitting and crocheting. Lillian genuinely loved and cared for others and, in turn, was deeply loved and respected. She had a contagious gift for sharing happiness and delight in life. Lillian is survived by her three children: Jon (Diane) Sabo, Cheryl (Mark) Walling, and Gaye (Terry) Gauthier; her three step children: Lee (Amber) Richardson, Connie (Dan) Best, and Judy (Truman) Bovee III; 15 grandchildren and 29 great grandchildren. Lillian was preceded in death by her parents (Nicholas and Anna); her spouse (James Richardson); her stepson Mark (Deborah) Richardson; and several siblings. Mass will be held on Friday, December 7th, 2018 at 10 a.m. at the Immaculate Conception Catholic Church in Forsyth, MT with reception to follow. Condolences may be sent to the family by visiting www.stevensonandsons.com. In lieu of flowers you may give a donation to the charity of your choice in Lillian’s name. Stevenson and Sons have been entrusted with arrangements. The family would like to express a special thank you to the staff at Morning Star Senior Living Community and Compasses Hospice for their amazing care and loving support. Sorry for your loss! Lil was a fun person and a good friend! You showed me this picture one time l can’t remember what you called it. It shows your beauty inside and out. I will miss you. Love our talks…..
She was fun, and so gifted at her crafts. I still have one of her angels, from several years ago. So sorry for your loss. Jonathan, Cheryl, Gaye and families- My sincere sympathy goes out to all of you at the loss of your dear mother and grandmother. Lillian left so many cherished memories for everyone from the delicious meals she made and the recipes she shared to her beautiful ceramics, flowers and vegetable gardens. Then there were the gifts of pickles, jellies and canned peaches! Her home was always filled with hospitality for everybody. She will be missed by many.. May she rest in eternal peace and happiness. Jon and family, Sorry for your loss. I will always remember doing ceramics with her. She had lots of good recipes that my kids use. I’m not much of a cook so my girls used them. She will be missed. Rest in peace from the BURKE family. I’m so sad to hear of Lillian’s passing. It was always a joy to visit with her. I will miss seeing her at events as she was always out and about. Your family is in my thoughts and prayers. Sorry to here my god mother has passed. My thoughts are with Gaye and her family. She was an awesome person who we will all miss. Rest in His Peace, Sweet Lillian. My cookie, canning, funny, inspirational friend. My grandma showed bitter determination and grit to the end. She was a strong independent woman and an amazing cook and baker. She loved to socialize and get her hair done. She was full of life and spice and will be greatly missed. Feel so blessed to be able to spend her last years, month, and days with her. To all of Lillian’s family. Sending thoughts and prayers as you begin this difficult journey. Lillian was a real sweetheart and she made the best pickles and meatballs, mom and Lillian had such a good time together. Deepest sympathy to all of Lillian’s family. She was such a beautiful person and touched everyone who knew her. She was a friend to all and was always busy in her kitchen. Trying to help her wasn’t always easy because she always ended up wanting to help you instead. Giving to everyone was her specialty! Rest in peace sweet Lillian you were one of a kind! Lillian was a great gal. She was nice to be around. We will miss jer. I still remember her voice and laughter. And I loved when she was a Girl Scout leader and we had meetings at her house. Always so much fun!! Wonderful lady. I remember her as being always filled with joy and generosity during my time in Forsyth. May she be granted the promise of Christ’s Heavely reward.